Keep users in found set? This is the relationship I have. It really works well I can have unlimited Topics for a piece of Information. Meaning Subtopic for Topics and so on. I have created a couple scripts that can deduce what I am calling the family. What I mean by family is all the members under the Information, every Topic and its Subtopics no matter how deep. So now with this list, could it become something I could receive benefit from storing in another table? My intuition says definitely, but I just want to be sure this is the way to go. I really would like to have a way to keep users in “subject-matter” only the Information and its Topics and Subtopic. Is there a way to keep users locked in a found set only or is this done via Interface design. Specific Tracking and What Power! 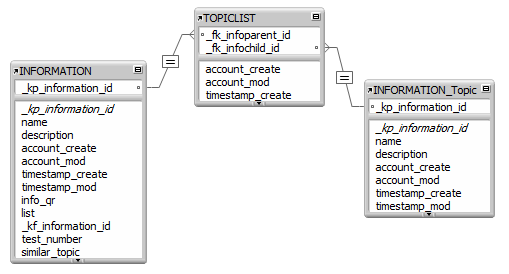 Does anybody know if there are ways to store a Primary Key and a Layout to track the back and forth navigation in your database. I would then want to attach a button to navigate back and forth. Now that I figured out that silly flashing error that I was dealing with, http://grasplearning.com/filemaker-forum/32-freez-window-flash--pop I am fully enjoying the power of Finds via Scripting that make it look like nothing else happened but the production of your desired result. Tell me are there things to know about strain on the system or memory if you do a lot of these? Or can I just do as much of this that make sense (of course within the scope of best practice)? I have been watching some training on FileMaker, and currently the instructor is showing how to build a system that navigates the Layouts in a solution. In the early stage of it, we have only added the back button. An interesting thing has come up, and I figured I am better off trying to fully understand what is going on rather than just be satisfied I can get it working in my solution. 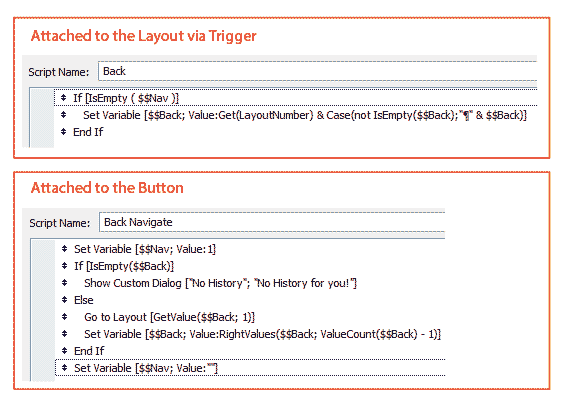 For the back button we built one Script that get attached to the Layout via a Trigger (it stores a variable that is list of Layout numbers) and one that gets attached to the button (It retrieve the Layout we want to return to and removes it from list). The instructor then explained why it wouldn't work (seems like it should). He says that the other scripts firing on the Layout will clash with it so it cannot do its job. He goes on to show a procedure that fixes the problem. I present it in the pictures, I think what is going on here is it is he is creating a clause that will say “no matter what, create a situation for this to run” but that is just what I see. What does this $$Nav global variable (pic) do for you that makes it work (it does work)? We have a need for a user to click on a checkbox for purpose of deeming something Complete. It is an important decision in our solution because once deemed Complete it will set up other options we need to do. We want to be sure this is the correct decision. I would like know about any methods of making an important decisions trigger have to be released with a safety. I was imagining a Script that displays a message that kind of gives a checklist or some things to consider before deeming something Complete. I guess a Script could take a user to a layout and give them just that. a checklist that once all criteria is met (checked) it could continue the Script and allow for the Complete choice to be chosen and If not, it will not allow it. I was thinking there may be other ways so I am inquiring. I have a field in my database called progress. This field for now is a checkbox set that has the choices, “Un Started” “In Progress” and “Complete”. Eventually I want an elaborate way to start determining the progress of certain tasks. For now this is a start to understand the way I will construct it. Is there a way to construct a chart that would take (let’s say) 8 tasks and average there progress field and summarize it to show an average bar of where there over all progress is. So I mean on a scale of 0 – 100 with 0 being “Un Started” 50 being “in Progress” and 100 being “Complete”. I also would like to know if you would have to use a script to show the found set of 8 (8 is just a number of tasks or a particular job could be 5, or 11) or is there a way to only chart for related records. I am trying to get a script trigger to fire after a record has been modified. Which "Event" should I link it too? Thanks! How to run a Script when the FileMaker database opens? I have created a script that I want to run when the database opens. Is that possible? How?